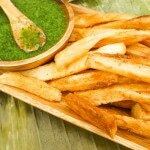 Yuca Fries with Cilantro Aioli | Mexican Appetizers and More! I posted this recipe about two years ago for and felt the need to re-post it today after making yesterdays snack. I made yuca fries with a chipotle mayo dip instead of the cilantro aioli and they were of course so good! So I was reminded to repost this awesome snack of yuca fries with cilantro aioli. Yuca fries are creamier and sweeter than your average potato fries. They can be enjoyed as a snack, side dish or an appetizer. 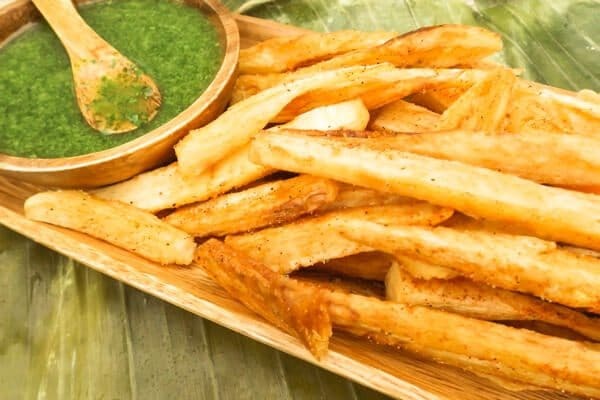 You can serve these yuca fries by themselves with just a little bit of salt sprinkled but serving them with the Cilantro Aioli makes these fries extra yummy and mouth-watering every single time! 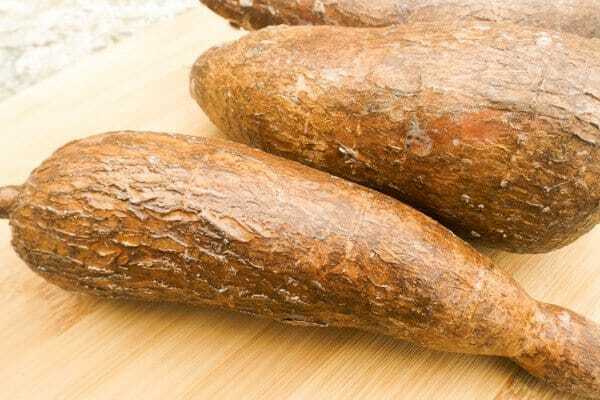 Yuca, also known as “cassava” is a food commonly served in North America, South America, Central America, Africa and Asia. Yuca, comes from the Euphorbiaceae family. It is the root of the plant. The root grows long and tubular with a rough brown exterior. The flesh inside is white. Yuca can be cooked in a variety of ways. You can boil it, fry it, bake it and even grill it. You can season it with an array of condiments. Ranging from simple ingredients such as salt, pepper and olive oil to chili powder and even chutney. However, yuca must be boiled before it can be enjoyed in any of the ways I mentioned, which is also the perfect time to remove the woody sprig located in the center of the root. This part is quite tough and rather unpleasant to chew through. 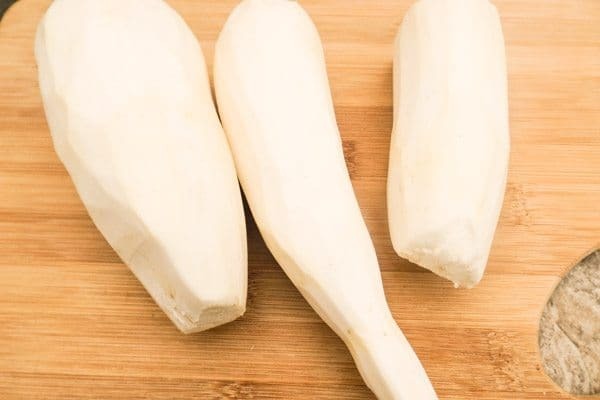 So now that you know a little bit more about yuca, go ahead and give these a try but please make sure to make the cilantro aioli. In my opinion this aioli is what makes this Mexican Appetizer or snack extra delicious. Although these fries are quite delicious on their own this “so simple to make vinaigrette” is so delicious, you will always surely make it when serving yuca fries. Also serve these yuca fries to the kiddos. Serve them with ketchup and they will love them! Add a cup of olive to a blender or chopper, with peeled garlic and cilantro. Blend for a few seconds until smooth. Add salt to taste. Peel yuca with a vegetable peeler until waxy bark skin is removed. Rinse under cool water and cut yuca in half. Fill a pot with water and boil yuca over medium heat for about 15 minutes or until fork tender. Strain yuca and water through a strainer. Let cool for a few minutes so it's not to hot to handle. Cut yuca in half once again and remove woody sprig from center. This woody sprig is tough to chew through so its best to remove it at this point. Cut yuca into slices and then into fry shapes. In a small bowl, mix the salt, cayenne pepper, paprika and black pepper. Set aside. Add vegetable oil to a heavy duty pot such as a cast iron skillet and heat oil over medium heat. When oil reaches 350 degress F. add yuca fries in batches and cook until golden brown. Drain on paper towels. Continue cooking until all are done. With your fingers tips, generously sprinkle hot yucca fries with the salt, pepper, cayenne and paprika seasoning (don't forget to wash your hands after!). Serve on a platter with cilantro aioli or ketchup for the kiddos! You can also serve as a side dish to chicken, beef or fish. Enjoy! Note: Some of the yucca fries may still have the woody fiberous string that you may want to remove went eating since it can be tough.